Mumbai, July 31, 2018 : Bank of India announced its audited results for the Q1 FY 2018-19, following the approval of its Board of Directors on July,31 2018. · Global Business of the Bank stood at Rs.8,78,351 crore as on June 30, 2018 against Rs. 9,34,796 crore as on June 30,2017. The de-growth in business level has been as a result of Bank’s conscious decision for curtailing the deposits volume, particularly the high cost ones and also because of rationalization of the Bank’s overseas exposure. · The Domestic Advances increased from Rs.2,81,570 crore in June, 2017 to Rs. 2,91,688 crore in June, 2018. The overseas advances, however, decreased from Rs. 1,09,492 crore in June 2017 to Rs.72,059 crore in June 2018 on account of Bank’s ongoing plan to rationalize overseas operation as also due to the impact of RBI’s restriction on buyer’s credit. · The share in CASA in Domestic deposits improved from 39.12% in June 2017 to 41.76% in June, 2018. · Retail Loans increased by 18.53% YoY and stood at Rs 49,088 crore as on June 30, 2018. The share of Retail Loans in Total Domestic Advances increased from 14.71 % in June 2017 to 16.83% in June 2018. · Priority Sector advances stood at Rs 1,18,469 crore which constitutes 40.64 % of ANBC. · Bank’s Gross NPA declined sequentially from Rs.62,328 crore in March,2018 to Rs. 60,604 crore in June,2018. The Gross NPA ratio stood at 16.66% in June, 2018. · The Net NPA stood at Rs. 27,932 crore in June,2018 against Rs.28,207 crore as in March, 2018. The Net NPA ratio stood at 8.45% as on June 30, 2018. · Total Global Restructured Standard Assets of the Bank came down from Rs.11679 crore as on June 30, 2017 to Rs 8923 crore as on June 30, 2018. · The Provision Coverage Ratio improved both on YoY basis as well as sequentially from 63.48% in June 2017 and 65.85% in March, 2018, the ratio has improved to 66.67% in June,2018. 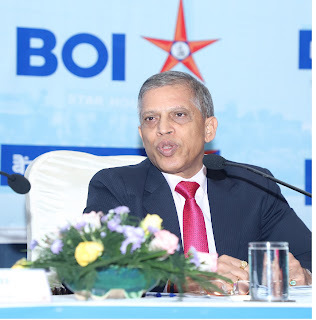 · The Bank’s Operating Profit for Q1 FY 2018-19 stood at Rs.1,869 crore against Rs. 2,379 crore during Q1 FY 2017-18. Sequentially, operating profit increased by 59.47% from Rs.1,172 crore during Q4 - FY 2017-18. · The Net Profit (PAT) of the Bank stood at Rs.95.11 crore in Q1 FY 2018-19 against Rs.87.71 crore for Q1-FY2017-18, signifying a rise by 8.44% . · Net Interest Income (NII) increased to Rs.3,354 crore during Q1 FY 2018-19 from Rs.2,533 crore during Q1 FY 2017-18, indicating a growth rate of 32.42%. · NIM (global) improved from 1.99% in June 2017 to 2.49% in June 2018. NIM (domestic) moved up from 2.39% to 3.05% during the same period. · Cost to Income Ratio has improved sequentially from 70.24% in March,2018 to 55.33% in June,2018. · Cost of Deposits declined from 4.58% in March, 2018 to 4.51% in June,2018. · The CRAR on solo basis (Basel III) as on June 30, 2018 stood at 11.43%. The CET1 capital stood at 8.01%, Tier-I Capital at 8.14% and Tier -II Capital at 3.29%. v Concept of Area Managers and Star Prime implemented for being more customer focused and for business development, recovery, digitization at ground level and re-activation of branches. v Monthly Campaign called “Ghar Ghar Dastak/Mahotsav” being organized every month for speeding up CASA, NPA Recovery and Credit disbursement. v Special CASA campaigns “Amantran” organized with special focus on Government, Business Associates, HNIs & NRIs. v Strategy for re-balancing of portfolio in favour of RAM advances (Retail, Agriculture and MSME) and reducing exposure to Corporate sector. v A non-discriminatory OTS Scheme called “Mission Samaadhan” formulated for quick resolution of NPAs. v “Swarna Dhara” – Gold Loans have been intensified. v Refurbishing select branches as “Star Digi” branches with high end digitalized services for tech savvy customers. v IT initiative “Star Mahashakti” being implemented for taking the Bank’s technological capability to next level. v Seamless “Information and communication Technology (ICT)” based basic banking services enablement in Rural & unbanked areas. v Selected as an “Authorized bank for Yen credit transaction by GOI-MOF” for Yen credit transaction. v Synergizing of MCB with LCB and Branches to reduce the Operational Cost. v Focus on Digitisation and Alternate Delivery Channels: Debit cards base increased from 485 lakh as on June 30, 2017 to 544 lakh as on June 30, 2018. Internet Banking users (Retail) increased from 43.23 lakh as on June 30, 2017 to 53.75 lakh as on June 30, 2018.
v Activation of 907 Growth Centers through Business Correspondents (BCs) called “Star Points” for expanding our outreach. v 2nd Most Trusted Bank in the PSU Bank category by Economic Times. v “Market Achievers’ Award” in Currency Derivatives Segment amongst Public Sector Banks by NSE. v “Best Performer in Currency Derivative Segment” amongst all Banks’ Category by BSE. v IDRBT Banking Technology Excellence Award, Best Bank for Managing IT Ecosystem, large Bank category. v IDRBT Banking Technology Excellence Award, Best Bank for Electronic Payments, large bank category. v Best Corporate Social Practices: Promoting Employment for Physically Challenged and also for Support and improvement in Quality of Education from ET NOW- WORLD CSR DAY Award. v Bank of India awarded as “The Most Efficient Bank in Kenya” by Think Business Banking Award 2018.
v Bank of India-Uganda Subsidiary awarded for “Best Company Keeping Image High Award 2018” from Indian Business Forum, Uganda. v “Runner-up Trophy for Best Bank on AEPS implementation” by NPCI. v “Runner up Trophy (3rd Prize) for Best Bank under – Atal Pension Yojana-Transformative Leaders Campaign.